As summer season has started, probably many of you are already looking towards vacation. 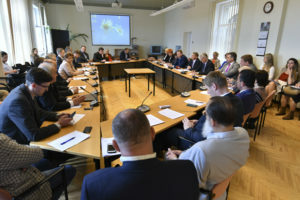 Despite the fact that main event for FICIL – High Council meeting 2018 – has passed, the works to improve investment climate in Latvia don’t stop. Main events reflected in the June’s FICIL newsletter. 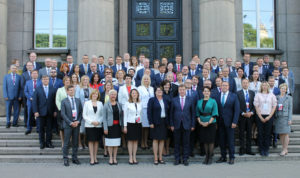 On 7 of June FICIL and the Latvian government met for the 22nd time at the High Council meeting to discuss improvements of investment environment. During the meeting, the Chairperson of the FICIL Board Zlata Elksniņa Zaščirinska presented FICIL’s vision on main priorities: leading concerns of foreign investors and progress of goals FICIL set for the government a year ago. The FICIL’s Position papers in six policy fields as well as the view on Macroeconomic policy were submitted to the Government before the meeting. At the end of the meeting, FICIL Honorary Chairperson Charlotte Norrby and the Prime Minister shook hands to demonstrate trust and agreed on following future cooperation priorities: 1) reforms in higher education, 2) fight against economic crime and 3) digital agenda. On 26 June the government supported amendments to the Competition Law allowing the Competition Council to take action against competition breaches of public persons. The proposed changes that will strengthen fair competition and good governance were also among the priorities of the FICIL’s Position Paper on the Security and Protection of Investment. The amendments will still have to be adopted by the Parliament; FICIL will continue to follow closely further developments. As FICIL noted in the Position Paper on Availability and Quality of Labour the shortage of labour force is a burning issue for many entrepreneurs and economy as such. Real and concrete solutions stem from the position paper. FICIL strongly recommends that the government adopts changes in the regulatory framework related to taxes to promote regional employment. Attraction of labour force from third countries is also among the solutions highlighted in the position paper. These solutions were reviewed also in Saeima Sustainable development committee meeting on 13 June. Report of the Saeima analytical office on situation in labour market and proposed solutions can be viewed here. The European Union representation in Latvia held a discussion forum ‘EU financial opportunities to tackle country specific recommendations’. The aim of the forum was to introduce the wider community to the European semester report and Country specific recommendations for Latvia. The FICIL Executive Director Marta Jaksona took part in the discussion and addressed FICIL priorities. The Ministry of Economy has finalised and presented the Action Plan to Improve the Business Environment Latvia. As the document is directly targeted to improve the business environment many of FICIL’s recommendations are included in the plan to track progress on regular basis. The respective FICIL work group leaders were actively following the Action Plan amendments by submitting specific proposals for inclusion in the plan. As the work group on abolition of mandatory procurement component continue to review the current situation in electricity market, FICIL is also actively taking part in the work group established under the Ministry of the Economy. FICIL believes that when evaluating Latvia’s competitiveness for industrial investments, experts must take a holistic view, taking into consideration all components of the energy cost, including electricity price, MPC and transmission and distribution costs. Only by conducting predictive impact assessment of the entire energy cost on Latvian economy, effect it has on the development of the country’s competitiveness can be analysed. FICIL is also vocally amplifying this opinion in the work group.